The 2018 SUU High School Jazz Festival presents the SUU Jazz Ensemble in concert featuring the Grammy Award-Winning Saxophonist, Aaron Lington, Saturday, February 17, 2018, at 1:30 p.m. at the Heritage Center Theatre. This concert is free and open to the public. 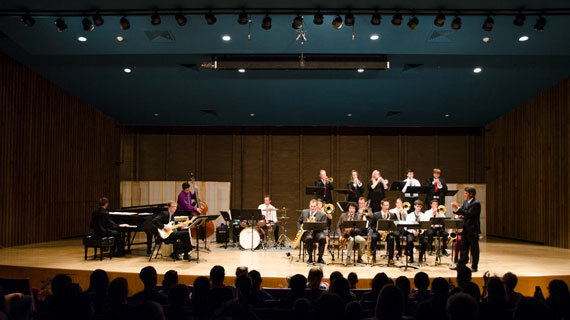 The SUU High School Jazz Festival is committed to the encouragement and fostering of jazz performance and education in the schools. As such, they invite the participation of jazz big bands and combos of any variety to register. The goal is to create a noncompetitive, positive, and supportive learning environment for jazz groups of all skill levels. Enjoy the musical expression of SUU’s Jazz Ensemble and Grammy Award-Winning Saxophonist, Aaron Lington, on Saturday, February 17, 2018. For more information on the Department of Music at SUU, please visit www.suu.edu/pva/music.